Bicyclists and pedestrians travel in Stockholm, where traffic has decreased significantly since the city started charging drivers a fee to enter congested areas. For the price of a large cup of coffee, Sweden’s capital turned the typical Monday rush-hour traffic snarl into the equivalent of a calm Saturday stream of cars. Six years after the city imposed a congestion fee on drivers coming into the urban core, the sense of sanity in Stockholm’s streets continues to awe local researchers, environmentalists, and politicians. Beginning as a seven-month experiment in 2006, Stockholm, a city of 820,000 people in a metropolitan area of 2 million, ringed the perimeter of the city center at 18 entry points with camera gantries. As cars cross into the so-called congestion zone, cameras take pictures of their license plates and automatically charge drivers a fee ranging from about $1.50 at non-peak hours to about $3 at peak. It was as if, for example, motorists were charged to cross in and out of downtown Boston from Cambridge or along Storrow Drive, or to approach the oft-choked Fenway, Longwood, and Boston University areas along Commonwealth Avenue, Beacon Street, the Jamaicaway, or Route 9. When the Stockholm scheme was first proposed, it sounded as improbable to many Swedes as it would to Bostonians now. Anti-congestion measures have been debated here since the 1960s, when Stockholm traffic jams were every bit as formidable as the backups on Interstate 93. The fees were not created out of stereotypical Swedish socialist comity. Long after Singapore pioneered the first congestion fee scheme in 1975, remedies in Stockholm were derailed by urban-suburban friction and condemnation of new taxes. 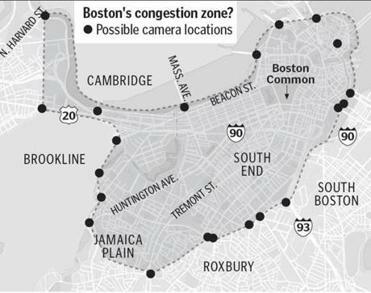 A Boston congestion zone: Where to draw the line? The city could easily borrow from the successful models of both Stockholm and London. But in 2002, the small, pro-environment Green Party gained critical leverage in Stockholm’s multi-party elections, and negotiated congestion pricing as the condition of joining a governing coalition. A trial was eventually set to begin on Jan. 3, 2006. To make public transportation more attractive as that date approached, Stockholm purchased nearly 200 new buses, created more park-and-ride spaces, and added kilometers of bicycling lanes. 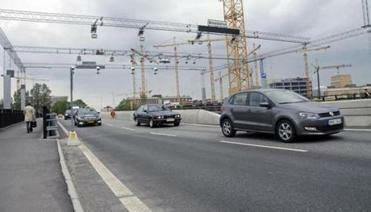 In Stockholm, cars pass through a checkpoint gantry, which is equipped with cameras. “If your goal is to move people out of cars, you have to have something to move them into,” said Stockholm traffic manager Daniel Firth. He was also a traffic manager in London, which implemented congestion charging in 2003. Even with the upgrades, public opposition to the fees initially ran as high as 75 percent. On Jan. 2, the day before the trial, the roads were packed. The next morning, rush hour came, and Swedes dropped a collective jaw. Traffic flowed smoothly, with large gaps between many cars. 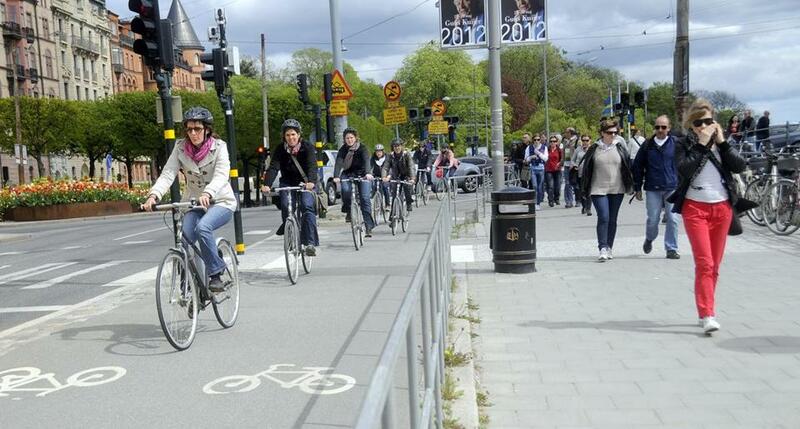 When the trial ended July 31, Stockholm had experienced a 22 percent reduction of traffic. But perhaps more importantly, peak travel times had been slashed. “Even many of the businesses that opposed the fees said they were getting deliveries on time for the first time in years,” Nilsson said. When the trial was over, the cars came back. Traffic volumes rose so close to their original levels that city residents, by a slim majority, voted to make the congestion charge permanent. The result made Stockholm the first city to approve such fees by election. The charges resumed in 2007, and today traffic is still 20 percent lower than it was. The percentage of trips to the city core by public transportation at peak hours rose to 78 percent. That dwarfs Boston’s 12.2 percent of metropolitan residents who use public transportation for work, according to the Census Bureau. Though Boston has the sixth-highest number of public transit commuters in the nation and a commuter rail system that stretches deep into the suburbs, the Green City Index by Siemens and the Economist ranks it only 17th in transportation quality among 27 major US and Canadian metro areas, in part because of a relatively low level of public transit availability per developed square mile. Boston’s transit system is on a path toward decline. The debt-ridden Massachusetts Bay Tranportation Authority’s recent fare hikes and service cuts come at a time of record ridership and as local officials work hard to recruit researchers and innovators. At best, there will be crushing rush hours on the subways, as a recent Urban Land Institute report predicted. More likely, discouraged MBTA users will go back to cars. Not long ago, I was on a Red Line train that took longer to creep from Dorchester to Cambridge than it took me to walk and ride both a bus and train 27 miles from my hotel in suburban Stockholm into the city. But retreating into cars has clear costs: Despite the $15 billion Big Dig, metro Boston auto commuters still sit through 47 hours of delays a year — longer than in Dallas, Atlanta, or Philadelphia — and waste $2.4 billion of fuel, according to the Texas Transportation Institute. Boston would not need to take as many cars off the road as Stockholm to see major relief. “I don’t think you’d need a 20- to 25-percent reduction,” said Tim Lomax, a senior research engineer at the institute. “If we cut 10 to 15 percent of the demand, I could be the king of Boston.” These numbers make Boston a prime candidate to be the first US city to try a congestion fee. But a proposal by New York City Mayor Michael Bloomberg to charge drivers $8 to enter midtown Manhattan died under fierce opposition from outside Manhattan. San Francisco is studying congestion pricing, but implementation would not likely occur anytime before 2015. The idea of congestion pricing was floated in Boston in 2005 by former city councilor Paul Scapicchio. He was widely pilloried (not least by the Globe’s editorial page). Yet the transit system cannot get better without a source of money to improve it. London, which imposed a stiff $15.50 congestion fee, netted half a billion dollars in the last two years to improve mass transit. In Stockholm, at least, the congestion charge proved potent in changing people’s habits while improving their lives. Jonas Eliasson, director of transportation studies at the Royal Institute of Technology, wrote that about half of the car trips that “vanished” were shopping and lesiure trips that motorists “did not even notice that they had canceled.” Yet researchers found an increase in department store sales. The Royal Institute’s Greger Henriksson, Karolina Isaksson, and Maria Borjesson said there was no universal mentality of those who stopped driving at peak. But congestion charging now enjoys two-thirds public support. A hint that congestion is forcing Boston to its own tipping point came this summer, with news that the city is working with IBM on an app to let traffic planners quickly locate congestion to take quick action to relieve it. But that already seems behind the curve; it was IBM’s sensor technology in Stockholm that helped get cars off the road, slashing afternoon peak drive time by half. Mayor Thomas Menino said recently, “We don’t do a good job of moving traffic. We’ve got to modernize.” There is no need for Bostonians to merely wish for modernization. Stockholm has already shown the way. The only question is if we have the will.